Details: Table and Chairs, Book Cases, Pig Rocker, Tent, Play Kitchen, Feather Art, Doll, Giraffe, Rug, Gold Dot Pillow, All printed art from Minted. 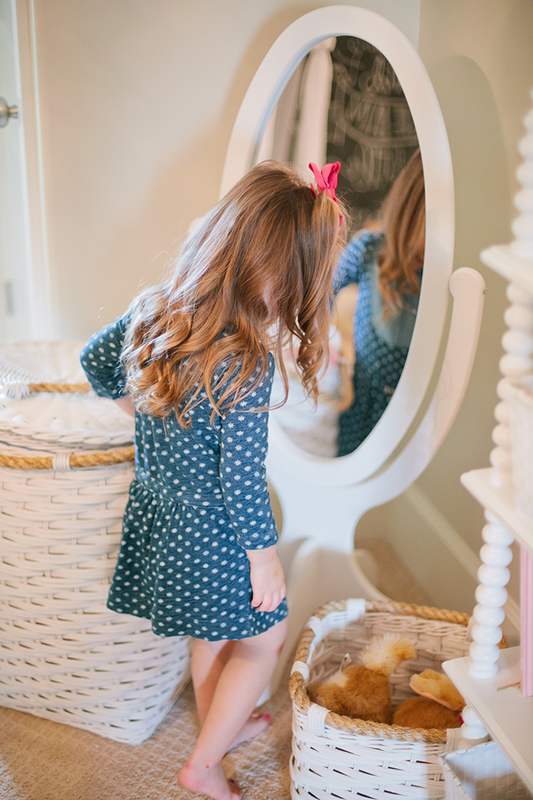 I am so excited to finally show you our playroom! 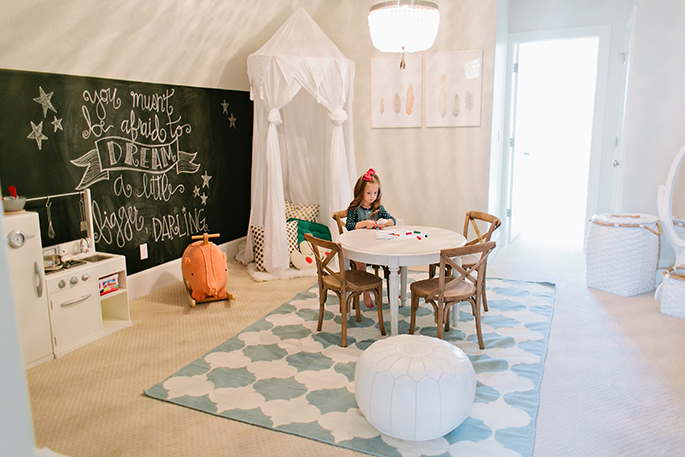 The Amazing girls from House of Jade Interiors designed the playroom for me and it turned out just how I wanted! 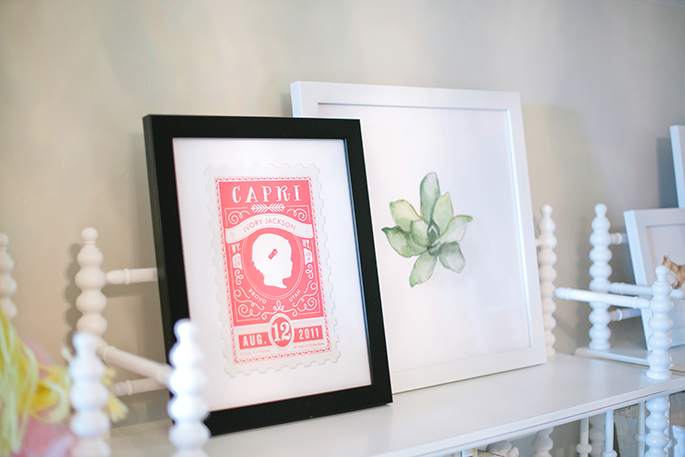 We decided that we wanted a soft color palette but still wanted it to be a fun, bright space for Capri and Cannon to play. I love it and most importantly Capri loves it. Have a wonderful weekend! I’m so obsessed with this chalkboard wall trend! Is it chalkboard paint? This is so adorable! 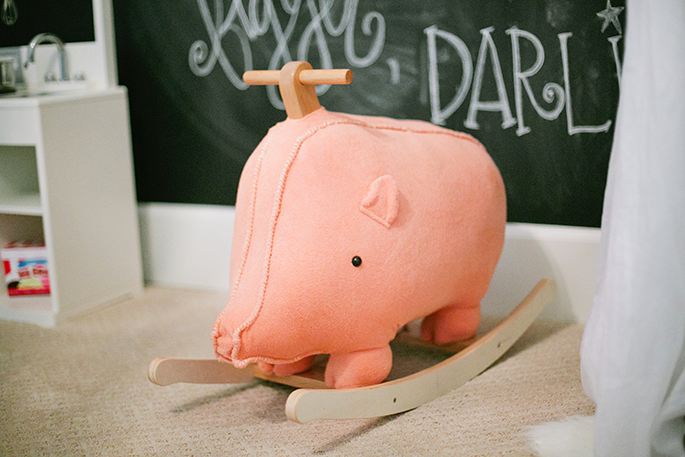 Love love love the chalkboard and rug, AND the cute rocker! I would have loved this as a kid! How adorable! Hey! I thought you had just moved out of your house, Is this at your new place? Love the room! …have you ever seen the movie where this quote on the chalkboard was taken from? lol. Just thought it was funny to use this particular quote for a children’s playroom, considering what that line refers to, but it is a nice quote out of context! OH MY WORD! It’s GORGEOUS!!!!!! Love everything about it! I love the new design of your blog! And the playroom is amazing. Capri must be so happy! I love the bright white colors!!! Our playroom is all primary colors and I’m thinking it’s time for a redo after seeing yours and lightening things up!! The chalkboard drawing and saying is icing on the cake. Love the playroom but even more the new site design. Really beautiful. Have a wonderful weekend. 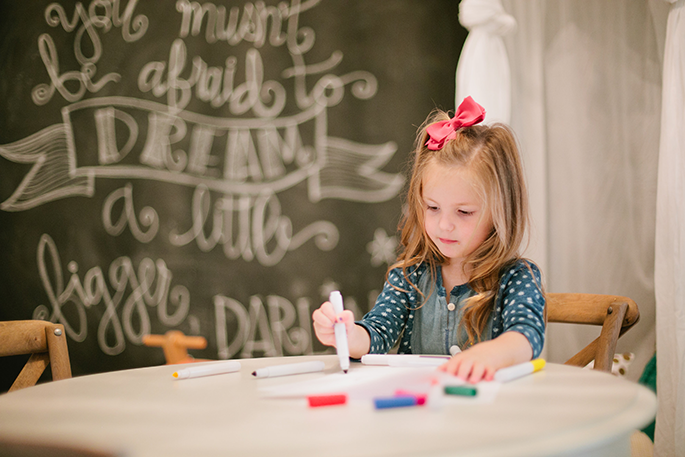 Love that chalkboard wall! Sooooo cool! What a fun, beautiful space! Also, I love your new blog design! This post is insanely adorable!! And, as a fashion/beauty lover, I just have to say your ponytail is pure perfection. 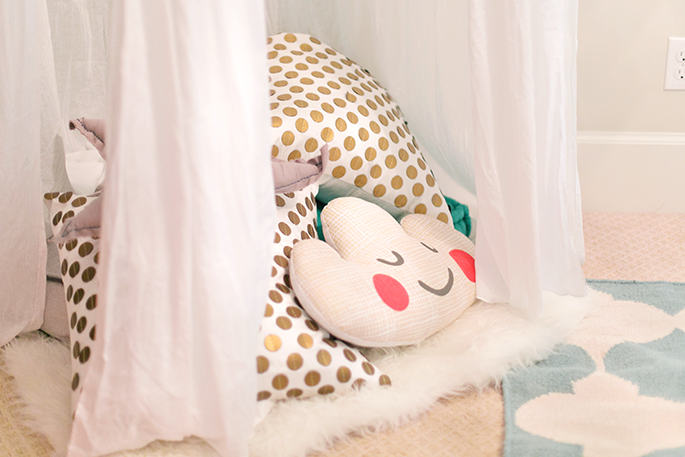 Completely adorable and magical space! The playroom is gorgeous! Love everything! Wow, such a beautiful playroom! Love the selection of colors and how bright it is!! Can you share where your sweater is from? I’d love to know where you found your adorable sweater and jeans!